So I was putting my four year old to bed two nights ago. We were reading Kevin Henkes' Lilly's Purple Plastic Purse. It's the one where Lilly adores her teacher Mr. Slinger, but when Mr. Slinger doesn't let her show off what she brought for show and tell, she gets mad. And when she gets mad she draws an angry portrait of the teacher and leaves it for him. That's the portrait up above. As you can see, in it she draws Mr. Slinger as fat, wielding both the image and the word as purposeful insults given that Mr. Slinger in the rest of the book is thin. Fat Mr. Slinger is also described as "mean", and "bad", and is portrayed as monstrous. You know studies have shown that children as young as 3 discriminate against those with obesity. 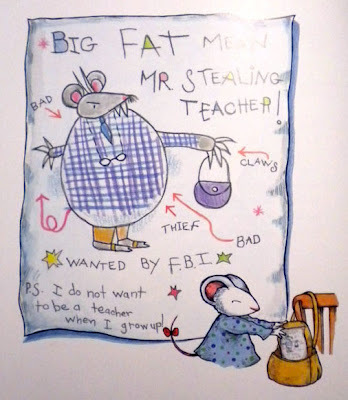 Given the pervasiveness of anti-fat bias in children's books and movies (this weekend we also saw/heard fat wielded as an insult in Despicable Me 2 and The Croods), and society as a whole, I'm betting it's a learned trait, not an intrinsic one.